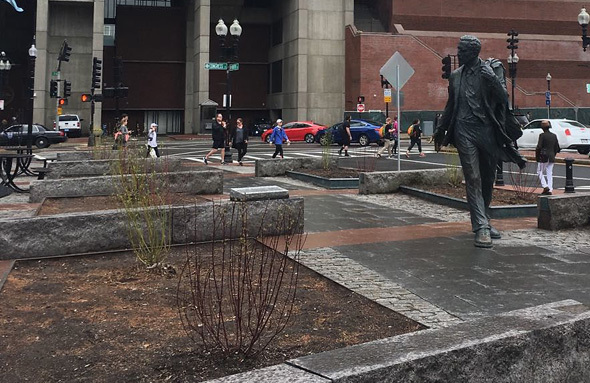 An annoyed citizen can't believe how nice shade trees were replaced by stubby little shrubs in front of Faneuil Hall and so filed a 311 complaint about it: Read more. Maureen Rogers said the waitresses had reason to be surly back in the day: The owner was prone to bouts of screaming and raging, the days were long and hard and the pay sucked. Still, she says she'll miss the Indian pudding (and provides a recipe for it). Samantha Washburn was among the people who tried to get into Durgin-Park tonight, after hearing the news the venerable restaurant would be closing forever on Jan. 12. Read more. Old Durgin-Park matchbook cover. See it larger. The place that's been serving food since before you were born will close forever on Jan. 12, NBC Boston reports. The joint just doesn't make money anymore, WBZ reports. Has anybody checked on the Union Oyster House? Image from the BPL matchbook-cover collection. 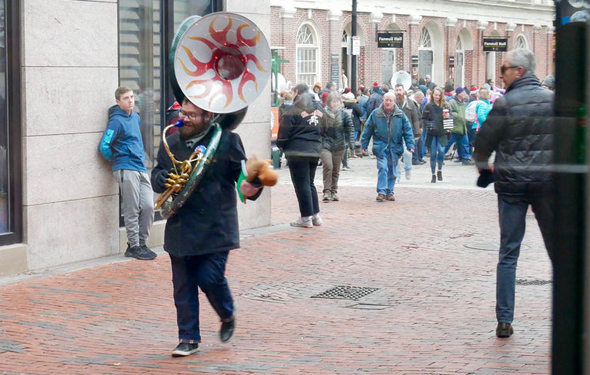 Leslee captured this tuba player near Faneuil Hall yesterday. 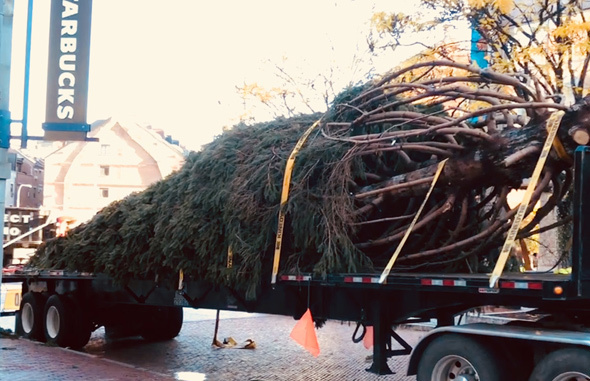 He was leaving the 2018 Boston Tuba Christmas performance which, yes, featured a pack of tuba players. Boston Police are taking no chances with the outcome of tonight's World Series game: Traffic barriers go up at 10 p.m. from the BU Bridge to Mass. 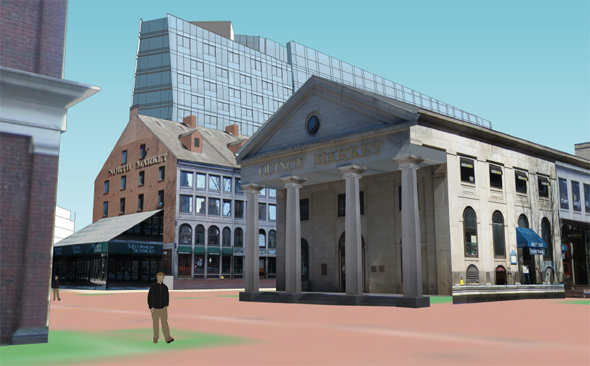 Ave. and along Boylston, Ipswich, Lansdowne, Van Ness and Jersey streets. Read more. 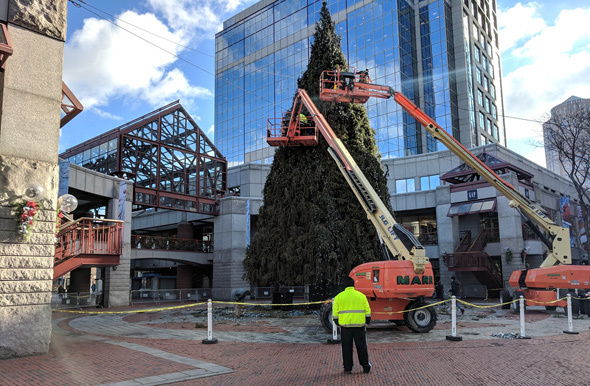 Alex Goldstein forwards the news that Mel Stiller, who has long led Friday-night singalongs at Jacob Wirth, will be playing at Faneuil Hall Marketplace until the restaurant recovers from water damage from a June 10 fire a couple floors up. 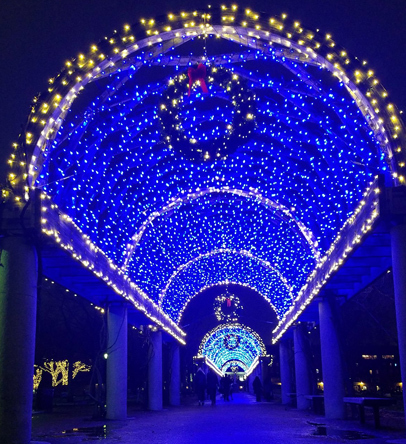 Stiller will play on an outdoor piano near Durgin Park and J.J. Donovan's, between 5:30 and 7:30 p.m. on four straight Fridays, starting on July 20. Huzzah! 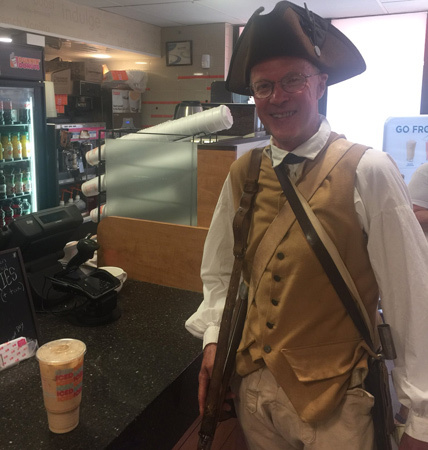 David Finnerty ran across this Minuteman picking up an iced coffee at a Dunkin' Donuts near Faneuil Hall this sweltering Independence Day. Is there a paleontologist in the house? Travel New England spotted this dino in trouble near Faneuil Hall Marketplace today, wondered if it collapsed from heat stroke or got hit by a car. 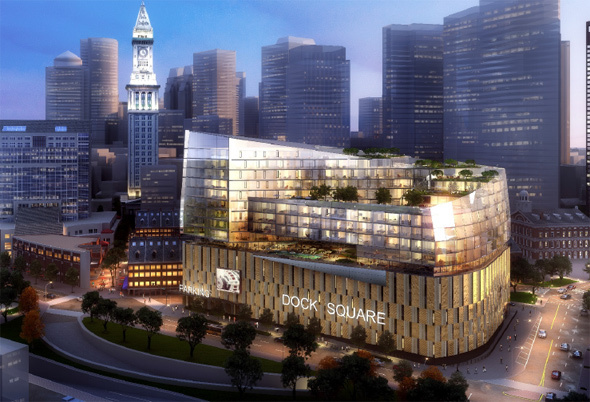 A Brooklyn developer has filed detailed plans for its proposed remake of the dowdy Dock Square garage, from several levels of parking with a restaurant at the bottom into a shimmering 17-story residential building with several levels of parking and a restaurant at the bottom. Read more. Not-at-all-shy hawk went for lunch at Boston's Quincy Market. It started right on the pigeon, thrilling and disgusting the tourists and locals. This young female brought the pigeon down with a thump (apparently dead before hitting the paving stones) and looked at 50 or so of us like, "You'd better not try to take my meal!" Oh, you want a look? But of course: Read more. A night out ended in the emergency room for a patron at Mija last month after another man with whom he'd argued with hit him square in the forehead with a glass from six to ten feet away, a bar owner and police said today. Read more. Flannfry braves the tourist warrens around Quincy Market to bring us this warning about the saffron-robed "monks" who are, once again, trawling for dollars. David Muir, who spent three years at Channel 5, anchored the ABC nightly news from an umbrella-covered platform at Faneuil Hall this evening - and Katie R was there to chronicle it. Don't worry, he wasn't here to cover some horrible disaster, just to give an address to the local Chamber of Commerce.